Flying Horse Theatre revisit Woking Drama Festival on 9th October 2009 with ‘Curtain Call’ by Keith Trezise and high hopes of improving on last year’s entry which was awarded the Adjudicator’s Award. Christopher Trezise is joined by new-comers Lee Bunting, Jennifer Uddin, Elvira Chojnowska and Sandy Chamberlain who complete the cast of this compelling new play. 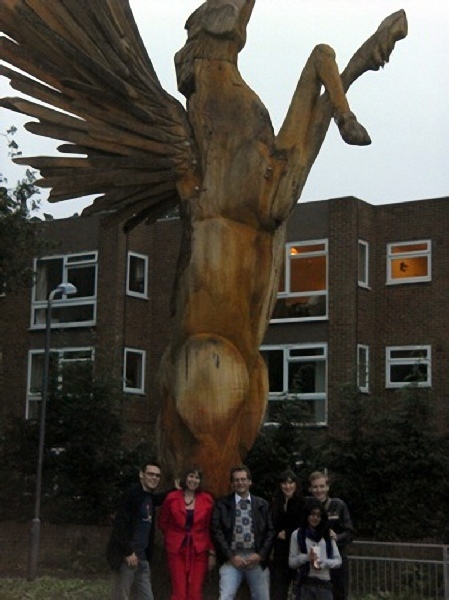 Flying Horse Theatre began in 2008 in order to enter Keith’s play ‘Branching Out’ into the Woking Drama Festival. place on Friday 17th October. theatre professionals to gain experience. If you think that Flying Horse Theatre could benefit you please don’t hesitate to get in touch via the ‘contact’ tab in the navigation bar above. Although primarily aiming at drama festivals, Flying Horse Theatre may well adapt and provide opportunities for touring village halls and theatres as and when the opportunities present themselves. 2008 is the beginning ... Long may the Horse take flight.